The year 2005 was another successful year for the UK non-life insurance market. Using Standard & Poor's commercial database of FSA Returns, SynThesys Non-Life, it can be seen that the market enjoyed a second successive year of underwriting profit (Table 1), albeit slightly lower than in 2004, leaving it with a small aggregate loss over the past four years of £327m. As a percentage of net premiums written, the underwriting profit in 2005 was also a little lower than in 2004, at 2.4% versus 2.7%. Growth in gross premiums written, meanwhile, continued to decelerate to 2.0% in 2005 from its very strong level of 16.9% in 2002. The net combined ratio for the market in 2005 extended its recent improvement as it moved down to 98.1% from 98.4% in 2004. This, in turn, reflected a small improvement in the net loss ratio (Table 2), although the gross loss ratio deteriorated slightly to 66.2% from 64.4%. In each of the past four years, the gross loss ratio has in fact been better than the net loss ratio, but never by more than four percentage points, which is quite a narrow range. Underlying the net combined ratio's recent improvement has been the beneficial impact of higher premium rates, better claims management, and the relatively low level of serious weather-related losses in the UK. Looking down the list of the top 50 groups in the UK non-life insurance market, it is interesting to see that of the 14 that wrote in excess of £1bn gross premiums in 2005, only four had a combined ratio of more than 100%. Conversely, of the 14 that wrote less than £200m gross premiums, only four had a combined ratio of less than 100%. While it is difficult to generalise about a market that is so diverse in terms of the types and origins of risks it writes, it is fair to say that primary direct and facultative business, which makes up the majority of the total market premiums (89% in 2005 on a gross written basis), has consistently performed much better than treaty business (Table 3). Indeed, the treaty business performance remains disappointingly poor. As Standard & Poor's identified in a report earlier this year, UK non-life insurers have in the past few years clearly benefited from the UK's stable, if slow, economic growth and low inflation; its very strong and improving insurance regulation; and their own improving enterprise risk management. Companies that concentrate on UK risks in particular, have also benefited from relatively benign weather and a lack of catastrophes. Nevertheless, 2005 saw an increasingly competitive environment emerging, which is persisting in 2006 (Table 4). On the basis of these public disclosures from two of the largest players in the domestic market, as well as other less specific reports (such as Zurich Financial Services), commercial lines' rates are clearly coming under pressure, while pricing in personal lines is still matching inflation. This suggests that the profitability of commercial lines will deteriorate in 2006 and 2007, while that of personal lines will stay stable. Given the recent good underwriting performance of the domestic market, it is not surprising that price competition has grown, especially as many insurers still have some room for manoeuvre before reaching their technical rates. Standard & Poor's is encouraged, however, by the repeated assertions by (and results of) several of the leading competitors of their intention to underwrite profitably and to forego uneconomic business. This active underwriting cycle management is expected to instil greater underwriting discipline and lead to a more muted pricing cycle than in the past. Consequently, Standard & Poor's expects the domestic market net combined ratio in 2006 to fall, but to remain below 100%, and the return on capital to decline. Further deterioration is also likely in 2007. Below, we take a look at the historic performance of three major business lines, and assess the outlook for each of them. This has been a very successful line of business over the past three years (Table 5), generating an aggregate underwriting profit of £2.1bn and an 8.3% return on net premiums written. The net combined ratio, moreover, has been comfortably below 100%, driven by improvement in the net loss ratio, and reached a very good 90.8% in 2005. Performance has been helped by the lack of any major weather losses in the UK (the last was in 2000), although ABI data shows that total gross incurred claims rose 39% to £2.9bn in 2005 from 2004. Disaggregating the 2005 performance into household and commercial (Table 6), there is a clear divergence between the two, although both are very profitable, which is almost wholly attributable to the lower net loss ratio within commercial property. Not surprisingly, this level of performance is not sustainable as it has attracted increasing competition, particularly in commercial property where premium rates are falling (Table 4). Household, on the other hand, is currently under much less rate pressure, but may well succumb to margin erosion given its good profitability. Overall, the net combined ratio is expected to worsen slightly in 2006, but to remain below 100%, subject to weather and catastrophe losses, as leading insurers resist chasing business at uneconomic rates. Standard & Poor's issued a report in August that stated "although headline results for the UK motor market, as indicated by the combined ratio, remain respectable, Standard & Poor's considers that the underlying accident-year ratios are a better indicator and clearly show a worsening situation." This view remains unchanged, although Norwich Union has since made a very public statement of intent to raise its private or personal motor rates, quite substantially in some cases, which may presage an overall improvement in private motor rates and, therefore, in the overall motor market. Often considered to be a very cyclical business, the performance of motor, as summarised in Table 7, shows a relatively stable picture over the past four years. Looking at its components for 2005 (Table 8), commercial motor performed much better than personal but, as it accounted for only 28% of motor net premiums written, its impact on the overall performance was limited. However, by removing the impact of prior-year claims reserve movements from the reported net combined ratio to derive the accident-year net combined ratio, it is evident that there has been a steady deterioration in the underlying performance since 2003 to the point where premium rates need to be raised in order to preserve profitability. Since 2002, there has been an increasing divergence of the reported net combined ratio from the accident-year net combined ratio due to the consistent and increasing release of prior-year claims reserves. In 2002, the difference was 1.9%, but by 2005 it had risen to 5.3%. This "subsidisation" of the reported ratio cannot, however, continue indefinitely and, at some point, the two ratios must converge. At the current accident-year level, and with the profitable commercial business under pressure (Table 4), Standard & Poor's believes that many companies will not be able to achieve their target return on capital for motor unless premium rates are raised ' ' (Standard & Poor's estimates that the industry has to produce a net combined ratio of 103% or less to make a 15% pre-tax return on the required risk capital). It is too early to determine whether the announcement by Norwich Union that it will increase private motor premium rates, in some cases substantially, will trigger an industry-wide increase in rates or not, but it is likely that after another year of deterioration in 2006, the accident-year net combined ratio should start to improve in 2007. 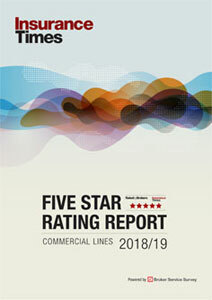 Long a source of frustration and poor results for UK non-life insurers, the commercial liability market has made excellent strides towards restoring its long-term health over the past five years (Table 9), culminating in a very attractive net combined ratio of 94.8% in 2005. The improvement has been driven by the fall in the net loss ratio, and evidence indicates that price competition increased in 2005 in response to this fall and is persisting in 2006, suggesting that the underlying underwriting performance is deteriorating. Liability underwriting has, over the past five years, produced an aggregate underwriting loss of £1.7 bn and a 9.3% negative return on net premiums written. For those insurers that have been participants in this line of business for some time, the last two "fat" years have only just begun to make up for the long period of "lean" years in terms of profitability. Yet, the very recent success of this line of business has already drawn greater competition (including new entrants) and put pressure on premium rates (Table 4), which in turn will lead to a worse net combined ratio in 2006 and 2007, subject to reserve movements. Nevertheless, as in other lines of business, leading insurers are publicly stating their commitment to maintaining their price discipline, which should help mitigate the severity of the competition. Space precludes no more than a cursory review of the performance of the accident and health and the pecuniary loss lines of business in 2005. Accident and health has been consistently profitable, and its net combined ratio improved slightly to 94.4% in 2005 from 94.6%. It should be noted that both the net loss and combined ratios of the two main accident and health insurers, BUPA and AXA, have remained very stable over the past five years. Pecuniary loss has been a profitable line of business for the past four years, and its net combined ratio was 95.7% in 2005 versus 91.7% in 2004. 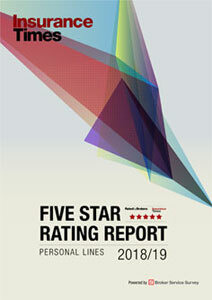 Personal lines financial loss, which is by far the largest element of this line of business, achieved a net combined ratio of 96%, and commercial lines financial loss a ratio of 92.7%.